There are a large number of protein-protein interactions in the cell. These interactions regulate all fundamental cellular processes such as cell cycle, and signal transduction. In this summary, we selected some methods to identify and analyze the protein-protein interactions. Introducing: Peptide Conjugation Magnetic Agarose, 10% bead suspension for pull down experiment, peptide-protein binding, protein-protein interaction and immunoprecipitation. The most straightforward method is to use the peptide as a bait in affinity pull-down experiments, and followed by detection of binding proteins. 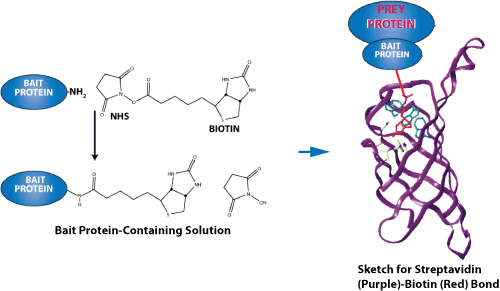 The synthetic peptides are used to verify the protein-protein interactions by competitive disruption of binding. For example, biotinylated peptides can be immobilized onto avidin-conjugated sepharose under controlled conditions. Peptides with a free cysteine can be cross-linked to nanoparticles, resins, or sepharoses to make affinity column. Peptides can be tagged with 6His, FLAG, V5 HA or cMYC for protein affinity chromatography. The sepharoses are incubated with a sample of interest. In order to detect weak protein-protein interactions, the concentration of bound protein should be as high as possible. The amount of extract applied to the column are very critical. If too little extract is applied, there will be too little protein retained to be detected. The affinity chromatography is incredibly sensitive and can be used to test all proteins in a extract equally. It is easy to make different peptides at its critical residues for specific interactions. The mutant derivatives of peptides can be used to examine the critical domain of a protein. Most unbound proteins pass through the columns. Bound proteins can then be eluted with high salt solutions, cofactors or other solvents, and analyzed by SDS/PAGE. A control column should be used to avoid a false-positive result because the protein may bind to another protein by ionic charge interactions. Immobilized streptavidin beads were mixed with biotinylated peptide prior to incubation with cell lysates. Cells were lysed in 1% (v/v) Nonidet P-40 buffer with protease and phosphatase inhibitors. Proteins were incubated with the immobilized peptides at 4 °C for 6 h. After washes, eluted bound proteins by boiling in SDS buffer. Eluates from the active and control bait peptide pull-downs were used for further analysis. Sketch for streptavidin-biotin binding. Streptavidin-biotin and avidin-biotin are the most prominent ligand-receptor pairs. Acetylation of TUG Protein Promotes the Accumulation of GLUT4 Glucose Transporters in an Insulin-Responsive Intracellular Compartment, The Journal of Biological Chemistry, January 5, 2015, doi: 10.1074/jbc.M114.603977 jbc.M114.603977. LifeTein synthesized multiple peptides with biotin on the N terminus with an aminohexanoic acid linker. Multiple lysines were acetylated in the synthetic peptides. These peptides were bound to streptavidin-agarose beads and used for pulldown experiments using cell lysates. The peptide acetylation is an important tool to study molecular regulation and interactions. Proteins can be fractionated by SDS-PAGE, and identified by their ability to bind a peptide, protein, or ligand. SDS-PAGE will inactivate most proteins and separate subunits of a complex. However during the blotting procedure, proteins are recovered by removing denaturants. Another option is to fraction the proteins by a nondenaturing gel system to remain the biological activity. The protein of interest can then be radioactively labeled, or biotinylated to probe gel strip, or a nitrocellulose membrane after gel transfer. This assay is not quantitative. One of the most commonly used methods for verification of protein–protein interactions is Co-immunoprecipitation (Co-IP). The first step is to generate the cell lysates. Then an antibody is added. The antigen is precipitated and washed. The final bound complexes are analyzed. Bait complexes are captured from cell lysate using a specific antibody. It is better to use monoclonal antibody for the precipitation. This is to confirm that the coprecipitated protein is not precipitated by the contaminating antibody. Polyclonal antibodies are usually preadsorbed against extracts to remove contaminants. 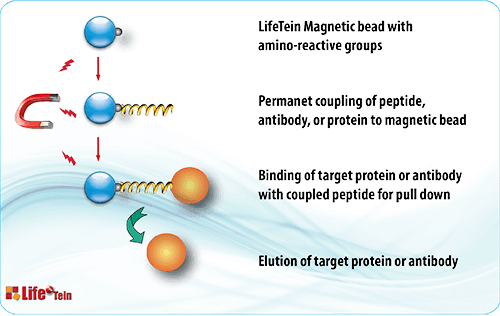 LifeTein's peptide antibody service uses peptide affinity purification steps to remove non-specific antibodies. The antisera are usually made by coupling of the peptide to the KLH carrier protein. Our peptide affinity purified antibodies remove antibody against the carrier KLH protein. Usually highly specific antibodies are required for Co-IP. However an antibody directed against the tag (instead of against the bait protein) can then be used if cells transfected with a plasmid encoding a tagged bait protein. The epitope-tagged proteins can often be eluted by incubation with competing peptides. This specific elution often reduces the amount of contaminating proteins in the eluate. The complex is then immobilized to protein A or protein G sepharose beads. After washing steps, the antibody, the bait, and proteins interacted with bait are eluted from the beads. The bound proteins can then be identified by Mass Spec or by immunoblotting. Performing a coimmunoprecipitating reaction and identifying physiological protein-protein interactions have many advantages. The proteins are at their natural state of posttranslational modification so the protein-protein interactions are genuine. However the coimmunoprecipitating can be difficult and generate significant background. This is because of the nature of the indirect interactions, nonspecific binding and antibody contamination that may mask detection. It is therefore important to conduct parallel negative controls, deliberately add an excess of the antigen, or covalently crosslink the proteins before immunoprecipitation. Use non-denaturing lysis buffers with low ionic strength (i.e., <100mM NaCl) that contain non-ionic detergents (NP-40 or Triton X-100). The most effective, nondenaturing elution buffer for protein affinity purification methods is 0.1 M glycine at pH 2.5 to 3. The low pH condition dissociates most antibody-antigen interactions, or antibody-Protein A/G interaction. Sonication or vortexing should be avoided. The samples should be handled gently in order not to disrupt the bound target complex. Wash the immune complexes thoroughly to avoid high background. Preclear the lysates to remove reactive contaminants. Incubating the sample with a nonspecific antibody is a good way to reduce the background. The light chain (25kDa) and heavy chains (50kDa) of the co-eluted antibody can confuse the results. Be sure to elute the antigen under non-denaturing conditions. Crosslinking antibody to Protein A/G-coated beads is effective to prevent antibody contamination. Membrane-permeable cross-linking reagents are used in vivo. The excess amino groups can inhibit cross-linking. In addition, the cross-linked protein can be released from the immune complex by cleavage of the crosslink with DTT. After the cross-linking, immunoprecipitation of the ligand protein is performed. Peptides or proteins can be labeled before cross-linking. This method will give a clean result. LifeTein routinely synthesizes biotinylated peptides for use in protein-protein interaction studies. Although biotin can be introduced either N- or C-terminally (via lysine residues), we recommend the use of an N-terminal modification owing to its low cost, higher success rate, shorter turnaround time, and ease of operation. Peptides are synthesized from the C-terminus to the N-terminus; therefore, the N-terminal modification is the last step in the SPPS protocol, and no additional specific coupling steps are required. In contrast, a C-terminal modification requires additional steps, and is usually more complex. However, in principle the biotin can be positioned anywhere. Biotin can be separated from the peptide by a variety of different linkers or spacers. Nevertheless, it is recommended that a flexible spacer such as Ahx (a 6-carbon linker) is included to render the biotin label more stable or flexible. LifeTein offers biotinylation at either the N- or C-terminus: biotin-N-terminus, Lys-biotin-middle of the peptide, and Lys-biotin-C-terminus. We also offer biotinylation using an Ahx linker or a long carbon (LC) linker: biotin-Ahx-N terminus, Lys-Ahx-biotin-middle of the peptide, Lys-Ahx-biotin-C-terminus. Biotin-labeled peptides are commonly detected or purified using avidin conjugates for many protein-based research applications, including western blotting, ELISA, immunoprecipitation (IP), cell surface labeling, affinity purification, immunohistochemistry (IHC), and flow cytometry/fluorescence-activated cell sorting (FACS). Elute the target molecule that is bound to its interacting proteins by altering the buffer used for elution. The high affinity of the biotin–streptavidin interaction allows the use of highly stringent washing conditions. This reduces the background binding that could be observed using other affinity tags or antibodies. Therefore, it allows the ability of two purified proteins to bind to be determined in a variety of buffer conditions. Because there are only a small number of proteins that are biotinylated naturally, there is only a very low chance of cross-reactivity. Therefore, biotinylation can be used to analyze protein-protein interactions in transcription-translation lysates. Biotinylated peptides can be used in conjunction with ELISAs or western blotting with streptavidin-HRP or affinity purified receptors or antibodies. Biotinylated peptides can also be immobilized tightly on streptavidin columns. Nevertheless, an N-terminal amine or an amine group on a lysine residue is needed for successful binding reactions.